Today is my last day of work and I have one last lunch — this time with the folks of my Genco project. We normally celebrate project closeouts by eating out but opted this time to have the food catered from our cafeteria, The Hub. See that handsome chap below? He’s the employee of the month because of his effort on the Genco project — helped the company eliminated a bunch of unproductive work. This guy is a genius, I kid you not. I learn new things everyday. Today, I learn of two new words – merienda and balut. 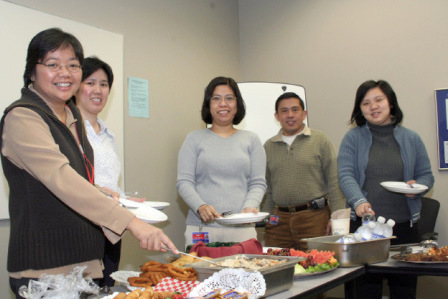 Some of the folks in IT threw a little merienda for Alex and I. Our last day at work is tomorrow. I have never heard of the word merienda before. Well, I was enlightened that merienda is a spanish word that means snacks. I like the Spanish — they did give the world the idea of siesta, right? Isn’t it nice — having a siesta after a meal and then waking up to a merienda? Anyway here are the folks who threw a farewell merienda for Alex and I at The Hub (the company cafetaria). Balut is a Filipino delicacy. Zimrie made them for brave souls in the farewell merienda. 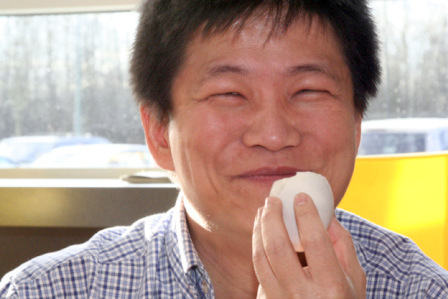 This is how Balut tastes like … gross! It is cold and rainy today. I did not sleep too well last night and as such it’s a great time for coffee to keep me awake. Suanne made me Vietnamese Coffee which is also known as Cafe Sua Nong. Vietnamese Coffee is normally served in ice but I like it warm on a cold day like today. 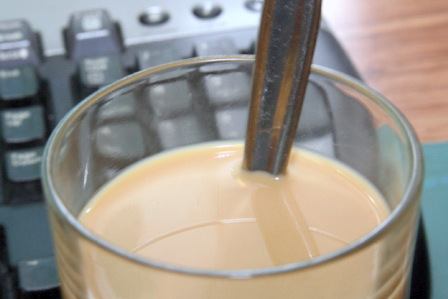 Vietnamese coffee can be made simply by mixing black coffee with a lot of condensed milk. 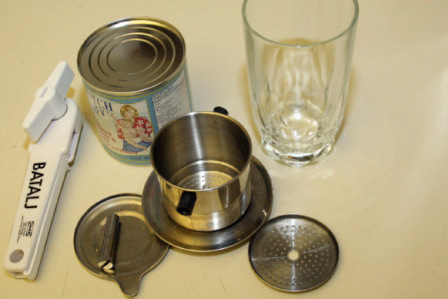 It is traditionally made by brewing the coffee with a small drip percolator into a cup containing condensed milk. We bought the percolator some time back from the T&T Supermarket. We can’t recall exactly how much it costs but it’s pretty cheap … something like $5 or so. We use whole coffee beans and like to grind it just before we use it to ensure freshness. Coffee once ground deteriorates fast. 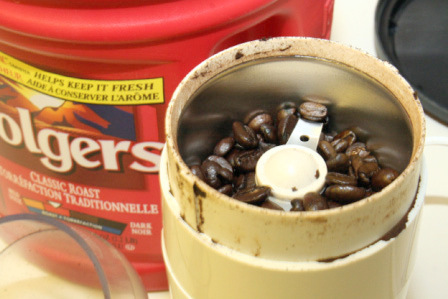 Ignore the Folgers can on the picture below … we just used the can to store our coffee beans. The horizon will not disappear as you run towards it. Last night Suanne and I had a timeout from the boys and we went to a fine dining restaurant called Horizons on Burnaby Mountain. 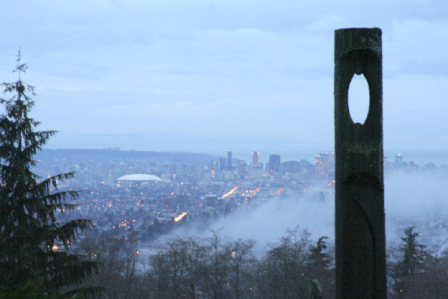 The restaurant is nestled in the beautiful Burnaby Mountain Park and overlooks the bright city lights of Vancouver below. We had a reservation for 5pm. At this time of the year, it’s just in time to see the sunset and the bright and yellow city lights turn on. While waiting for the restaurant to open we had a quick walk around the park in the crisp chilly weather … the city looks so beautiful from here. This place is also referred to as The Playground of the Gods because of the many Japanese wooden sculptures on the park. 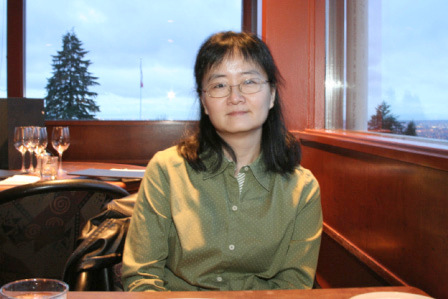 We were seated by the windows and had a panoramic and spectacular view of the city and the Burrard Inlet. Already we knew this would be an enjoyable night. We see people starting to come in for dinner — many dressed in their finest. Suanne too was stunning — with her new leather jacket and all! Updated on 12 April 2010: This restaurant has closed according to Urbanspoon. 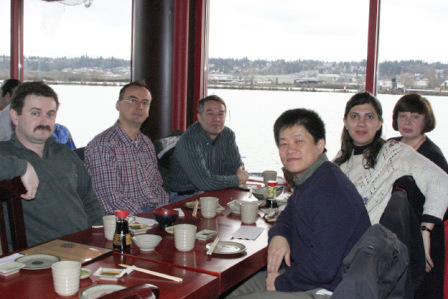 The folks in the Service and R&R Project teams went to an all-you-can-eat sushi. They selected the one which is called Top Gun Sushi at the Quay. It is located on the second floor of the Public Market at the New Westminster Quay. I have never been there before but I have heard so much about Top Gun Sushi. 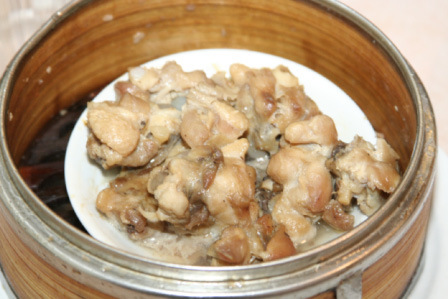 Although it has ala carte but it is famous for it’s all-you-can-eat. We went early and arrived at 11:30am to make sure we have a table. It was a great idea because the place was really packed, especially so because it’s a Friday afternoon. We had a great table by the window which overlooks the Fraser river. I have farewell lunches everyday right until my last day at work next week. Already I have gained 1kg since last week. I am not going to weigh myself anymore until all these lunches are over. Today’s lunch is the “official” farewell lunch which is organized by the PMO. We went to the Cactus Club Cafe on Kingsway. 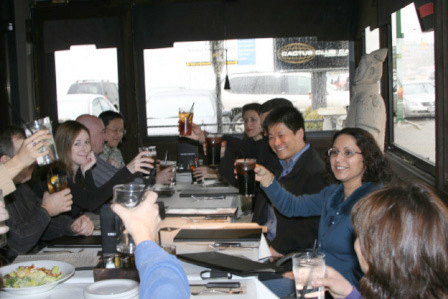 The Cactus Club offers casual fine dining and has a very global menu. This place is one of the favourite lunch places the people in the company goes to because of the menu caters to every palate. The menu includes items such as dim sum, quesadillas, steak, burgers, pasta, ribs, and fajitas. Check out their menu and prices. I ordered the grilled salmon which if I recall correctly, costs $10. 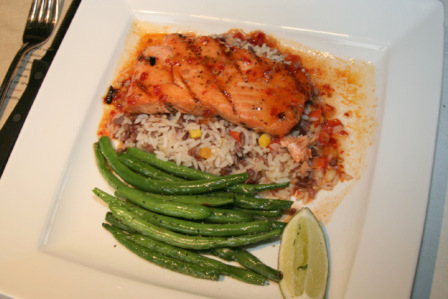 The salmon is served with rice and green beans. The sauce used to cook the salmon is pretty spicy. I like the green beans which has a touch of saltiness. It was a big serving. My boss paid for my lunch. Oh, I should have ordered the Ultimate Mushroom Deliglace at $31 … just kidding boss! It was a good gathering and felt appreciated because the PM team showed up along with many members of my projects. We did not talk about work at all, which is a good thing. We just … chatted. It has been a pleasure working with them all. Updated 17th Jan 2011: This restaurant had closed according to Urbanspoon.com. “I heard” is good; “I saw” is better; “I tasted” is best. 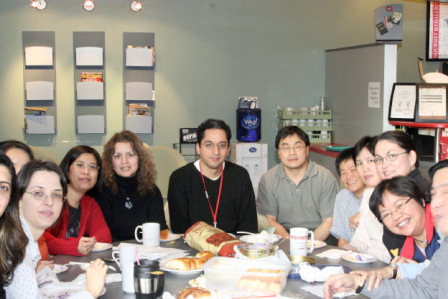 The chinese employees at my workplace organized a Chinese New Year lunch celebration today. We do that every year. This year, they have graciously invited Suanne too for the lunch because they wanted to also make this a farewell lunch for me. For the first time, the organizer decided that we go to a buffet for a change. 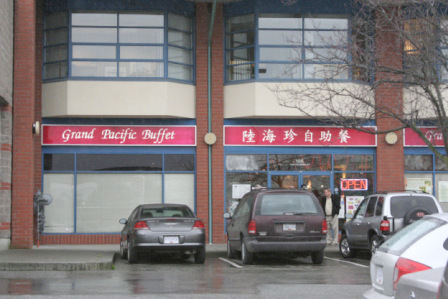 We went to the Grand Pacific Buffet in New Westminster. 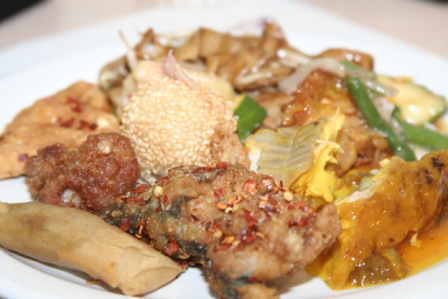 The Grand Pacific Buffet is a buffet with Western, Chinese and Japanese food with predominantly Chinese food. There were a lot of varieties. 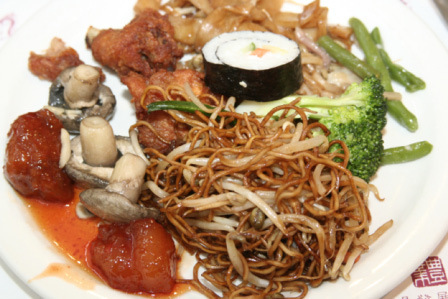 The food is so-so but then it’s not fair to compare buffets to the normal restaurants. I was wary of MSG with the tell-tale thirstiness after the meal but nope, it was not at all. Suanne and I went for two full rounds and ended up sharing the dessert. The photos below does not tell much but anyway, these are our second round plates. It’s about $8 for a weekday lunch. Last night I made a thousand plans, but this morning I went my old way. 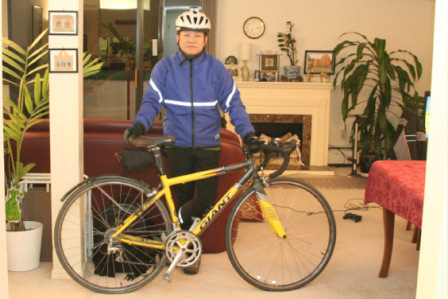 OK, I know this is not about food but I thought I have a break and blog about something I love to do very much — biking. Well, many of you already know that I am leaving Best Buy. It’s been a long six years and my last day at work is next week. Today is about the only day I could bike to work and so I thought I make a change and blog about my commute to work. My new place of work will be further and worse, I will have to navigate two killer hills. I guess it’ll be a while before I get the chance to bike again. 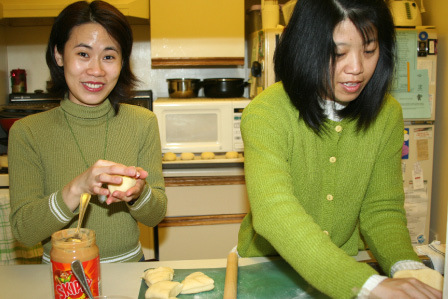 Polly and Xiao Qin came by this morning to make the buns Ben & I blogged earlier. 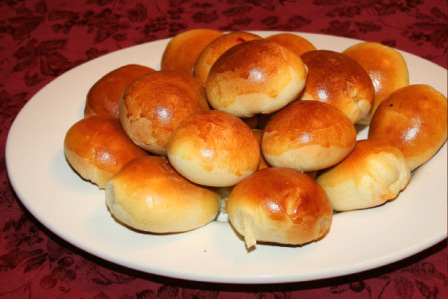 We made two batches of buns and experimented with four different type of fillings. Polly brought her own (stir-fried) minced pork and Xiao Qin brought some peanut butter. I still had some pulled pork leftover and I also bought some lotus paste from the Great One Supermarket. I had the dough prepared the night before. So, we started off immediate filling the dough. Polly and Xiao Qin did the filling for almost all the buns while I played paparazzi. It was pretty hard work as it took almost 1 hour to fill 24 buns. We baked the buns in two different batches. A good name is better than good habits. We went to a Vietnamese restaurant today for lunch. There are a lot of Vietnamese restaurant serving Pho’ in Vancouver. 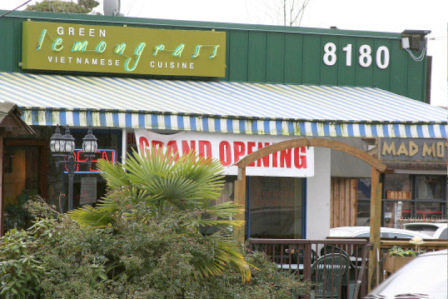 The Green Lemongrass Vietnamese Cuisine restaurant we went to is apparently new because we have never noticed it before. If we remember correctly, I think it used to be a Greek restaurant. 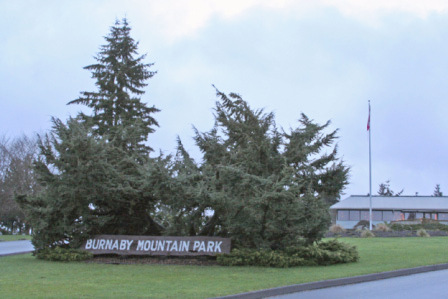 It is located in 8180 Westminster Hwy, just next to the Richmond Public Market. Click here for the Google Map of this location. We ordered three dishes to share among the four of us because Vietnamese noodles always comes in very big bowl. 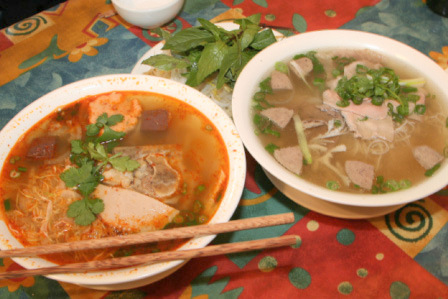 All Vietnamese restaurants served the traditional Vietnamese noodles called pho — noodles in clear beef broth. Arkensen always ordered either the Beef Ball Noodles or the ubiquitous No 1 Special. This time he ordered the No 1 Special which comes with thin cuts of beef (steak, fatty flank, lean flank, brisket), tendon, tripe and meatballs. Since Nanzaro liked spicy food, Suanne ordered the spicy version — Pork & Beef in Hot & Spicy Soup. The large No 1 Special costs $5.95 while the Hot & Spicy version is $6.95.